Former Glee star Mark Salling has been found dead near his Los Angeles home in a suspected suicide, weeks before he was due to be jailed over possessing child abuse images. Mark Salling, 35, was expected to get between four and seven years in prison after pleading guilty to possessing child abuse images. The actor’s sentencing was due on March 7. He played footballer Noah “Puck” Puckerman on Glee from 2009 to 2015. Mark Salling entered into a plea deal last October, avoiding a lengthier prison sentence of up to 20 years. He was arrested in 2015 after a tip-off that he was in possession of images of children being abused. 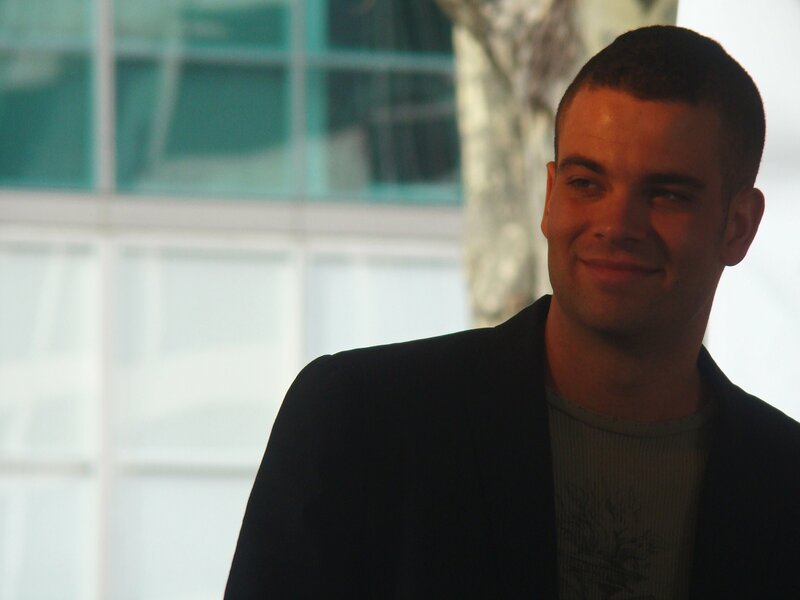 Mark Salling’s body was found in woodland near to where he lived in Sunland, Los Angeles, media reports suggest. In the February edition of Complex magazine, Big Sean opens up about the theft his ex-fiancée Naya Rivera accused him of. After deciding to call off their wedding, the rapper and his Glee-starring ex started hating each other rather publicly and turned to social media, music and any forum they could find to trash one another. Naya Rivera even went so far as to accuse Big Sean of stealing a pricey Rolex Submariner from her. “@bigsean stealing rolexes from a lady’s house now. Maybe cuz I’m on Glee and making more money or something. #triflin,” Naya Rivera tweeted at the time. She later deleted it. Although she married Ryan Dorsey three months later, their apparent hatred for one another continued as Big Sean then released I Don’t F— With You, which was rumored to be about Naya Rivera. “Second of all, every Rolex that I have, I have receipts for, papers for, certificates of authenticity for. I would never steal a Rolex from anybody. “You see [Naya Rivera’s] tweet got deleted in like 20 seconds,” the rapper adds. Big Sean doesn’t comment on whether or not rumors of Naya Rivera’s alleged jealousy and controlling tendencies are true, but he does open up about the reason why their relationship dissolved. He said they began fighting more than they did anything else. But he does add that he “wasn’t surprised” by her accusation. Big Sean said: “I felt like it was unnecessary drama ’cause in my eyes it wasn’t true. I wasn’t surprised by it. Big Sean is now dating Ariana Grande. He says that they began as really good friends, which is one of the aspects he respects most about their relationship. Glee star Jenna Ushkowitz and her partner Michael Trevino have split after three years of dating. According to one insider, the relationship has been over for some time. Jenna Ushkowitz signed autographs for fans during the interaction, and kept her head down. “That’s okay, no worries,” she added, smiling, when the photographer apologized. Jenna Ushkowitz and Vampire Diaries star Michael Trevino, 29, made their first public appearance together at the 2011 SAG Awards. 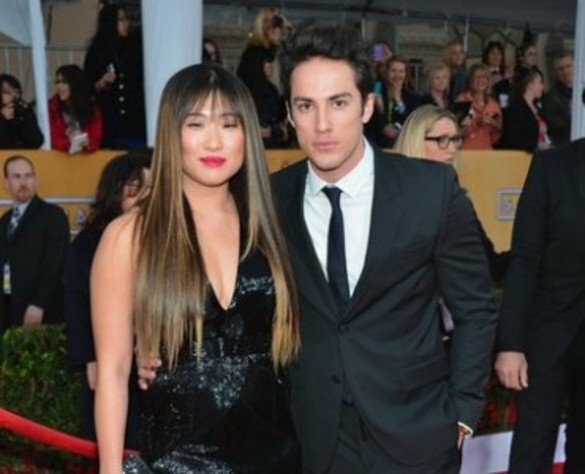 Last January, Jenna Ushkowitz posted a throwback picture of the pair on the SAG red carpet in honor of Michael Trevino’s birthday. “Happy birthday to my best friend, the one who has taught me how to laugh and love more and more everyday,” she gushed. Lea Michele has debuted a new song she recorded in honor of her late boyfriend and Glee co-star Cory Monteith. Just weeks ahead of the release of her debut album Louder, Lea Michele, 27, has shared a new track, You’re Mine, explaining that it was inspired by Cory Monteith, who died from a drug overdose last year. 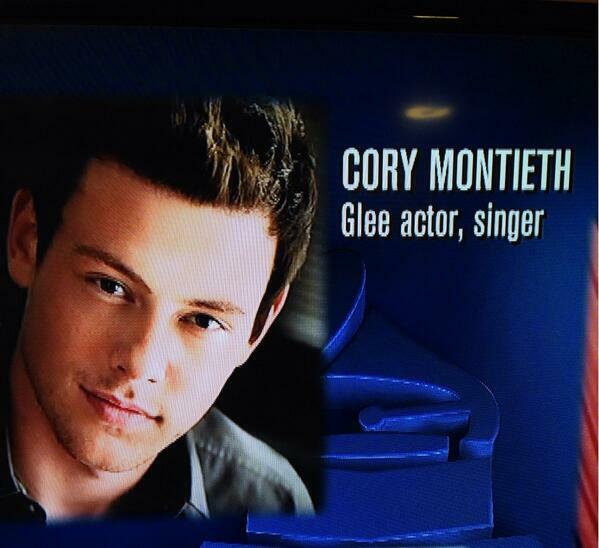 The Grammy Awards organizers made a pretty big mistake during its In Memoriam tribute Sunday night as Cory Monteith’s name was misspelled during the annual montage. 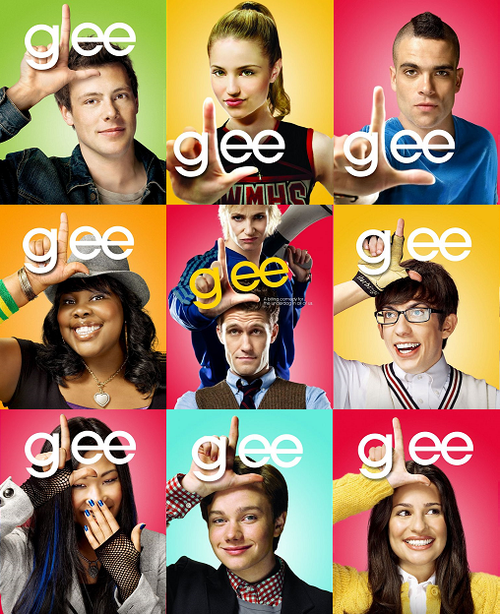 The late Glee star’s name was written with the “e” and the “i” reversed. Glee fans immediately noticed the error and took to Twitter to express their anger. “Dear Recording Academy, it’s 2014 & no one has spell check? His name is Cory MONTEITH!!! Fire the fact check clerk!” one fan tweeted. Cory Monteith died in July from a fatal combination of drugs and alcohol. The Fox’s musical Glee will end after the next series, show creator Ryan Murphy has confirmed. Speaking at a media event in Los Angeles, Ryan Murphy said he had planned for the sixth season to revolve around the characters of Rachel and Finn. However, following the death of actor Cory Monteith, who played Finn, in July, he was forced to create a new ending, TV Line reported. Ryan Murphy added he had penned a new finale that would be in Cory Monteith’s honor. “The final year of the show, which will be next year, was designed around Rachel and Cory/Finn’s story,” Ryan Murphy said. “I always knew that, I always knew how it would end. I knew what the last shot was – he was in it. I knew what the last line was – she said it to him. Ryan Murphy said he planned to pitch his new ending for the show to US network Fox later this month. “I think it’s very satisfactory and kind of in [Cory Monteith’s] honor, which I love,” he added. The show said goodbye to the actor in a special tribute episode broadcast in the US last week. 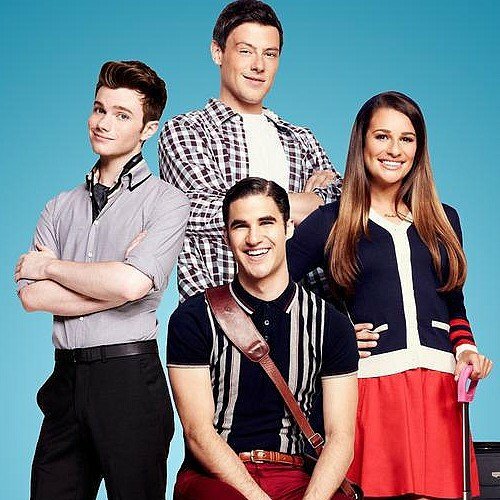 In April this year, Fox renewed Glee for a fifth and sixth season as part of a two-season deal. It had been hinted the sixth series could be the last, however it was not confirmed at the time. Cory Monteith died of a fatal cocktail of heroin and alcohol, the coroner’s report has revealed today. 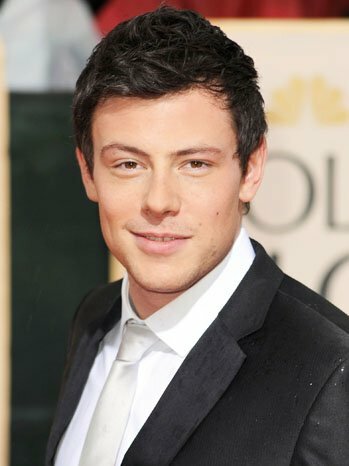 The 31-year-old Glee star, who played Finn Hudson on the hit TV show, was found dead in a Vancouver hotel in July. Investigators at the scene found drug paraphernalia, including “a spoon with drug residue and a used hypodermic needle, along with two empty champagne bottles and multiple glasses”. Coroner Claire Thompson concluded that Cory Monteith’s death was “accidental”. The final findings support the initial coroner’s report into the death of the Canadian actor on July 13. At the time of his death, Cory Monteith had an alcohol level of 0.13 percent, with a “moderate” level of intoxication. The report also pointed to the presence of morphine, codeine and “6-monoacetylmorphine,” a by-product of heroin. Hotel video footage showed the actor returning alone to his room in the early hours of July 13, marking the final time he was seen alive. “He had checked in to the hotel on July 6 and had been expected to check out on the 13th,” the report stated. Cory Monteith, who had been in Glee since its inception in 2009, was admitted to rehab earlier this year having struggled with addiction since he was a teenager. The coroner’s report said the actor’s “periods of abstinence ranged from years to months in duration”. The report found that Cory Monteith’s erratic drug use contributed to his death, adding that “after a period of cessation from opiod drug use, a previously tolerated drug concentration level may become toxic and fatal”. Glee, which follows a group of American high school misfits who form a singing club, will pay tribute to Cory Monteith in a special episode to be broadcast next week. “[The] third episode will deal with the Finn Hudson character being written out of the show,” Fox’s Kevin Reilly told reporters at a Television Critics Association meeting in August. Glee – now in its fifth series – is known for its upbeat pop covers and cameo appearances by celebrities. 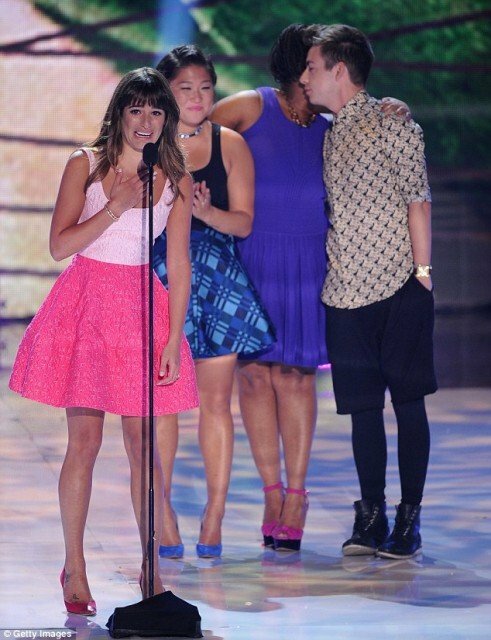 The cast of Glee was honored with an award for choice TV show comedy at Sunday’s Teen Choice Awards at the Gibson Amphitheatre in Los Angeles. Show star Amber Riley thanked fans for their unwavering devotion as she cast are returning to the screen this fall for their fifth season without show breakout Cory Montheith, who played Finn Hudson. “Although we lost someone that we really love, that you guys love too, we are very fortunate to come back [for the next season],” she said. “Cory was like a brother to us and like a dad, and you know he was always ready to sign an autograph for a fan – he loved you gleeks and he loves his fans. “So on behalf of our brother and our classmate, we accept this award,” Amber Riley continued. Cory Monteith’s former girlfriend and Glee co-star Lea Michele, who won the award for choice TV comedy actress, tearfully took to the microphone to pay tribute to her former boyfriend. “I just wanted to be here today to personally thank all of you and tell everyone out there how much all of your love and support has meant to me over these very difficult past few weeks,” Lea Michele, 26, said. Lea Michele continued: “I wanted to dedicate this award to Cory, and for all of you out there who loved and admired Cory as much as I did. I promise that with your love, we’ll get through this together. “He was very special to me and to the world, and we were all lucky to witness his incredible talent, his handsome smile and his beautiful, beautiful heart. Cory Monteith, who co-hosted the Teen Choice Awards in 2010, was found dead July 13 in Vancouver, British Columbia. An autopsy revealed Cory Monteith, 31, died of an overdose of heroin and alcohol. Lea Michele talks of her happiness with boyfriend Cory Monteith in a newly released interview with Marie Claire Mexico – which she gave just weeks before his tragic death. Lea Michele, 26, reveals the support and encouragement she gets from Cory Monteith as she tells Marie Claire how thankful she is that they met. “He is the best person I know, he has made my life so incredible, and I am so thankful for him and not only to have him as a partner but also as a co-worker,” she told the magazine. Cory Monteith was found dead on July 13 after a heroin and alcohol overdose. Lea Michele gave her interview on June 7, with her boyfriend visiting her on the set of the photo shoot so they could have lunch together. Marie Claire Mexico’s editor in chief Ariadne Grant said that he “showed up in great spirits”. In a statement Ariadne Grant added that the Glee couple were “very nice and obviously happy and in love”. Lea Michele, who apparently learned of her boyfriend’s death during a girl’s night, graces the cover of the magazine’s August issue and the stunning image has now been released. She smoulders in just a black blazer and matching underwear. The gorgeous brunette looks strong and powerful with lashings of eyeliner in the image. In her interview Lea Michele also revealed her style icons. “I think that is one of the hardest questions because they are so many, but I have always looked up to Penelope Cruz,” she said. Lea Michele went on to describe her own personal style as “very relaxed and simple: jeans, flats and a leather jacket”. Cory Monteith’s girlfriend and Glee co-star Lea Michele is said to have made an emotional trip to the Vancouver hotel where the actor died of a heroin and alcohol overdose. Lea Michele, 26, visited the makeshift memorial outside the Fairmont Pacific Rim hotel where fans have showed their respects by laying flowers and tributes, RadarOnline reports. Eyewitness Rik Feydick told the website that Lea Michele, who was accompanied by two bodyguards in an SUV, didn’t leave the vehicle but peered through the windows looking “crushed” and hiding behind giant black sunglasses. Once Lea Michele and her bodyguards realized she had been spotted her driver was said to have abruptly sped off, according to Rik Feydick. Earlier this week, Lea Michele attended a private cremation service for Cory Monteith, along with his mother. 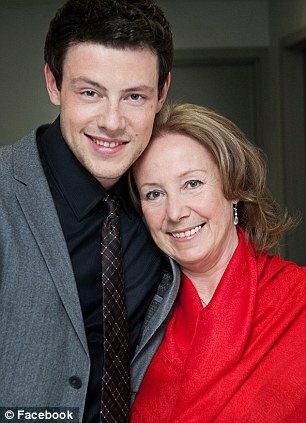 She had earlier visited the hospital to view Cory Monteith’s body and is said to have played an integral part in making arrangements following his death. Cory Monteith, 31, was found dead in his hotel room on Saturday. An initial autopsy and toxicology report revealed Cory Monteith died from a lethal combination of heroin and alcohol. Cory Monteith’s final video, showing the actor warning his young fans to “stay out of trouble”, has surfaced. Cory Monteith was filmed just days before his tragic death from drug and alcohol use. In the video, the 31-year-old takes the tone of an older brother: “Hi Malorie, I’m Cory – I’m Sheila’s friend. The clip was filmed on July 6 as Cory Monteith was onboard a flight to his hometown of Vancouver, where he checked into the Fairmont Pacific Rim Hotel. It was there his body was found just seven days later. A fan of the actor’s hit show Glee posted the clip online. 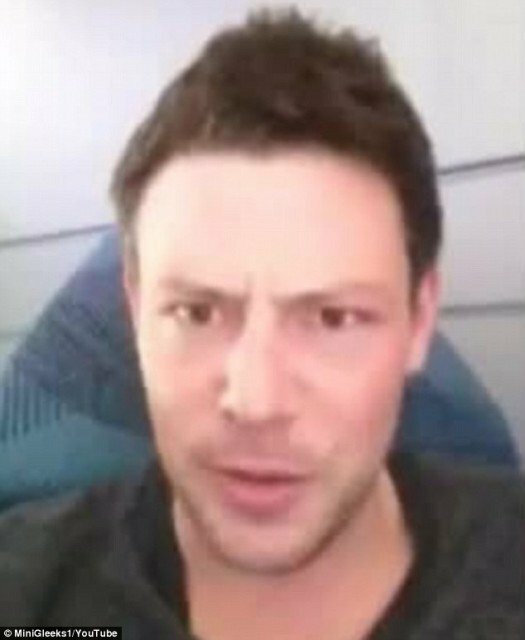 According to Global News, Cory Monteith was approached by Sheila, a flight attendant, for a memento for her boyfriend’s daughter Mallory. Despite his warning “to stay out of trouble”, initial investigations indicate that a combination of heroin and alcohol lead to the young actor’s death. After spending time with friends and family in Vancouver, Cory Monteith’s body was found in his room on the 21st floor of the hotel. It was noted that at this stage there is still no evidence to suggest that Cory Monteith’s death was “anything other than a most-tragic accident”. But Police Constable Brian Montague later revealed: “There was evidence in the room that was consistent of a drug overdose,” adding that he wouldn’t “go into specifics”. Cory Monteith cause of death has come as a shock to some after it was initially reported that police did not believe drugs to have been involved, but Brian Montague explained they need to err on the side of caution. “It was the opinion of the investigators that it was a drug overdose, but we didn’t want to speculate,” he said. According to new reports, Cory Monteith hid his deadly drug addiction even from those closest to him. Cory Monteith’s ex-girlfriend, Mallory Matoush, told Us Weekly, that the Glee star was “just a happy guy” and that she saw no sign of the addiction that would ultimately claim his life. “Cory kept me in the dark about his drug use,” Mallory Matoush told the magazine. “He was always so silly and funny,” she added, explaining that she only ever saw him drink and then never to excess. Cory Monteith and Mallory Matoush met June 2011 and dated for eight or nine months. “Cory was so normal. I didn’t even know who he was when I met him,” she recalled. 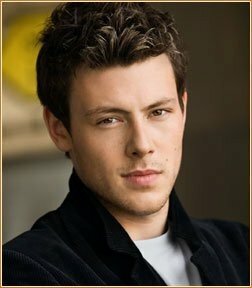 Cory Monteith was found on Saturday in his hotel room at the Fairmont Pacific Rim hotel in Vancouver. The Canadian actor – who completed a stint of rehab in April for substance addiction – was last pictured with his girlfriend Lea Michele just last month. It’s been confirmed that Cory Monteith died from a “mixed drug toxicity, involving heroin and alcohol”. Cory Monteith had checked into the hotel on July 6 and had been due to check out on Saturday. However, video footage had shown Cory Monteith returning to his room by himself after an evening out with friends on Friday. Cory Monteith and his girlfriend Lea Michele were planning to move together before his death, it has been reported. Cory Monteith was found dead in his hotel room in Vancouver, Canada, on Saturday, but prior to his sudden passing he was reportedly making arrangements to move into his Glee co-star Lea Michele’s Los Angeles home, although the couple – who had been dating for more than a year – were not talking about marriage. An insider told Us Weekly: “Lea and Cory were planning on moving in together after he got back from Vancouver. “[Lea Michele and Cory Monteith] weren’t talking engagement or marriage yet but it was heading that way. Cory Monteith and Lea Michele – who is “devastated beyond belief” about her boyfriend’s death – were said to be more in love than ever just before he died and planning a happy future together. The source added: “They were 100 percent happy and together and in love at the time of his death. Meanwhile, it has also been reported that Cory Monteith’s autopsy that was scheduled to take place today will now be delayed. Cory Monteith was seen drinking alcohol with his friends in Vancouver just one week before his death, it has been reported. Cory Monteith – who completed a month-long stint in rehab for substance addiction in April – was seen “laughing and drinking beers” reports TMZ. The 31-year-old Glee star was pictured with his friends on July 6, the day he checked into the Fairmont Pacific Rim hotel, where he was found dead by hotel staff one week later. 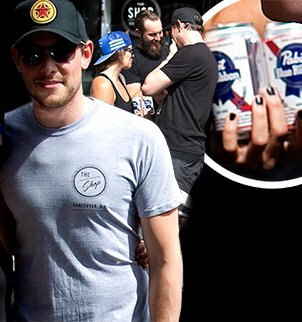 Cory Monteith was also pictured next to a mystery brunette who is seen holding two cans of beer, although it was not his girlfriend Lea Michele who was believed to have been in Los Angeles for work at the time. The actor was reportedly seen drinking alcohol with his friends outside The Shop, a local men’s clothing and motorcycle accessories store, according to the owner. A source told TMZ that the actor was seen drinking three beers in the course of a few hours but did not seem out of control. However, it has been revealed that on July 11 he had dined manager Elena Kirschner and acting mentor Maureen Webb at East of Main where the actor seemed happy and did not drink alcohol. Cory Monteith had organized the dinner because he was planning on getting more involved with Project Limelight Society, a free theatre programme for kids who are driven to perform. Two days later Cory Monteith was discovered dead by hotel staff after he failed to check out at the designated time. While there are no implications of foul play, the cause of death has been yet to be confirmed. Selena Gomez is one of the many celebrities paying tribute to Cory Monteith after his tragic death in a Vancouver hotel room at the age of 31 on Saturday. Selena Gomez, 20, posted a picture of herself and Cory Monteith hugging on the red carpet of the 2011 Kids’ Choice Awards. 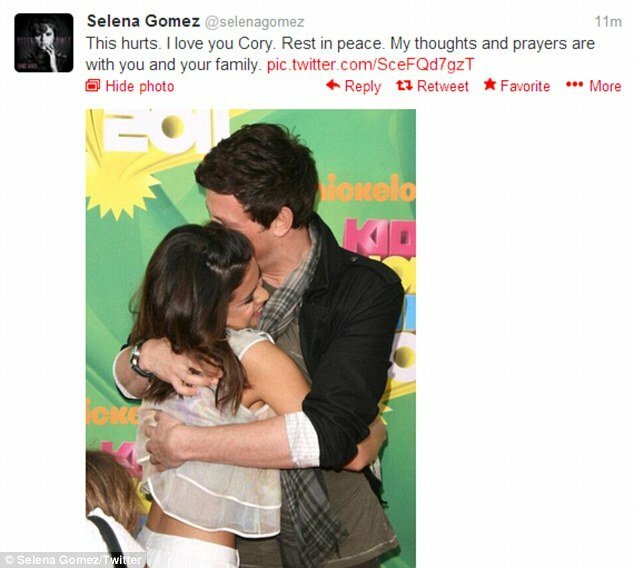 Selena Gomez was just one of numerous celebrities who took to their Twitter pages to express their shock and grief over the death of Glee star Cory Monteith. 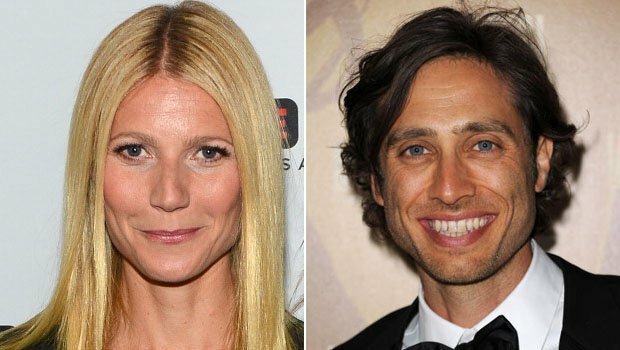 Gwyneth Paltrow, who also appeared in the show, released a moving statement in tribute. “Cory was a sweet and talented man. My heart breaks for Lea and the entire Glee family,” said the actress. 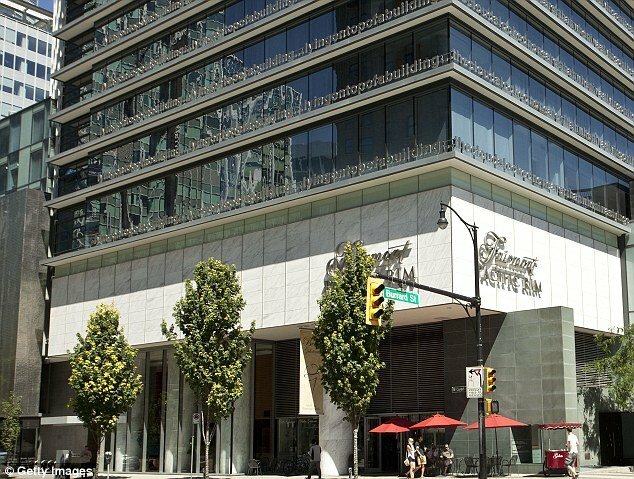 Cory Monteith’s body was found shortly after noon by Fairmont Pacific Rim hotel staff. According to the Vancouver Sun, there are no indications of foul play, and an autopsy is scheduled for today. Cory Monteith had spent his last hours enjoying an evening out with friends before he tragically passed away of unknown causes while alone in a hotel room in Vancouver, Canada. The 31-year-old Glee star – who completed a stint in rehab in April for substance addiction and appeared to be “happy and healthy” in recent months – was out in Vancouver before returning alone to his Fairmont Pacific Rim Hotel in the city. 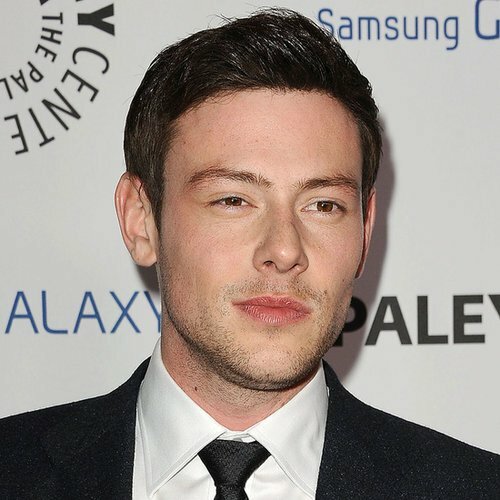 Cory Monteith had been in his luxury hotel room with friends on Saturday evening before heading out for the night. His girlfriend and Glee co-star Lea Michele is not believed to have been with him. No cause of death has been confirmed at this point but there was said to be no implications of foul play. Medical examiners will conduct an autopsy on Monday. Recent pictures of the star showed him looking happy and healthy in the company of his long-term girlfriend after flying into LAX in California. Authorities refused to say if there was any connection between Cory Monteith’s voluntary stint in rehab and his untimely death, the Toronto Star reported. They also declined to comment on the contents of the room. It is believed that Cory Monteith had been dead for several hours in his room before his body was found. 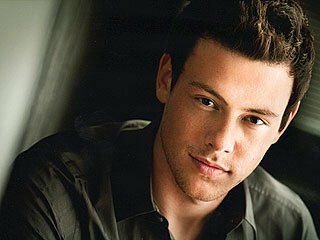 Cory Monteith had been due to check out of the luxury hotel on Saturday but when he failed to do so, cleaning staff went to his room where they found his body. Paramedics were called who declared him dead at the scene shortly after noon. Police said there were no signs of foul play and said that Cory Monteith had died alone. Video footage has revealed Cory Monteith returning to his room by himself after an evening out with friends on Friday. 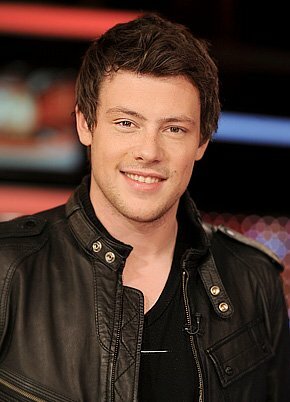 Cory Monteith had checked into the hotel room on July 6 and was due to check out on Saturday. The actor, who played the character Finn Hudson in the popular Fox show, had spoken publicly about his battle with addiction. He had previously received treatment aged 19 and commented that he took “anything and everything”, according to the Vancouver Sun. Cory Monteith’s family, who live in Calgary, were notified shortly before police held a press conference over the tragic news. Cory Monteith has been found dead in a Vancouver hotel, police say. Glee star Cory Monteith, 31, who played Finn Hudson in the Fox TV hit, was found dead at the Pacific Rim Hotel in the city centre on Saturday, said police. Cory Monteith, who had been in the musical comedy since its 2009 start, was treated for drug addiction in April, and had a history of substance-abuse. His body was found by Pacific Rim staff after he missed his check-out time on Saturday, said Vancouver’s Deputy Police Chief Doug Lepard. Cory Monteith had returned to his room at the Pacific Rim alone early on Saturday morning having been out with friends earlier in the evening, said Deputy Police Chief Lepard. Cory Monteith had been dating Lea Michele, who played his opposite number Rachel Berry in Glee, which follows a group of American secondary school misfits in their quest for singing contest glory. Lea Michele loved and supported her long-term boyfriend and was proud he was seeking help, she told People magazine at the time. 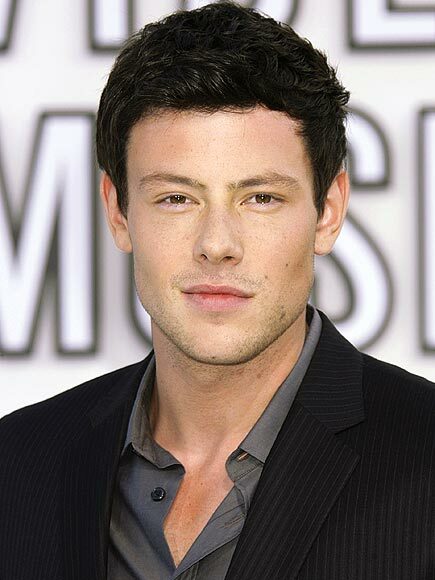 Calgary-born Cory Monteith described himself on Twitter as “tall, awkward, Canadian, actor, drummer, person”. Cory Monteith was treated for drug abuse aged 19 and had been open about his battle against addiction, telling one interviewer he took “anything and everything”. Fox has renewed Glee for two more seasons, meaning the TV series will air at least six in total, through May 2015. “Glee debuted as the first and only successful musical comedy series on television, and more than four years later, it continues to defy genres, break new ground and have a significant impact on popular culture,” said Fox chairman Kevin Reilly in a statement. The current season features some of the school’s graduated seniors, played by Lea Michele and Chris Colfer, scattering from Ohio to New York City. Glee is averaging 8.7 million viewers this season, including viewing delayed up to 7 days. That’s down from last season but the show remains one of Fox’s most popular as it weathers a steep decline by American Idol. Glee star Naya Rivera and her new boyfriend Big Sean made their official debut as a couple at the premiere of new movie 42 in Los Angeles on Tuesday night. Naya Rivera and Big Sean strolled onto the red carpet hand-in-hand, before posing up with their arms around each other. While they had been spotted together on various occasion over the past few months, Naya Rivera and Big Sean looked thrilled to finally be making their romance official as they attended the event at the TCL Chinese Theatre. Naya Rivera, 26, smoldered for the waiting photographers, showing off her slim figure in a grey snakeskin dress and white pointed heels, leaving her dark brown hair loose in tumbling curls for the occasion. Big Sean, 25, meanwhile, appeared to find the red carpet event slightly more amusing – grinning with delight he joked around pulling faces and funny poses behind his girlfriend’s back. They first sparked romance rumors when Naya Rivera was see at the rapper’s surprise 25th birthday party in Las Vegas earlier this month. Prior to her romance with Big Sean, Naya Rivera has been linked to stars including Douglas Booth, as well as her Glee co-stars Mark Salling and Kevin McHale.